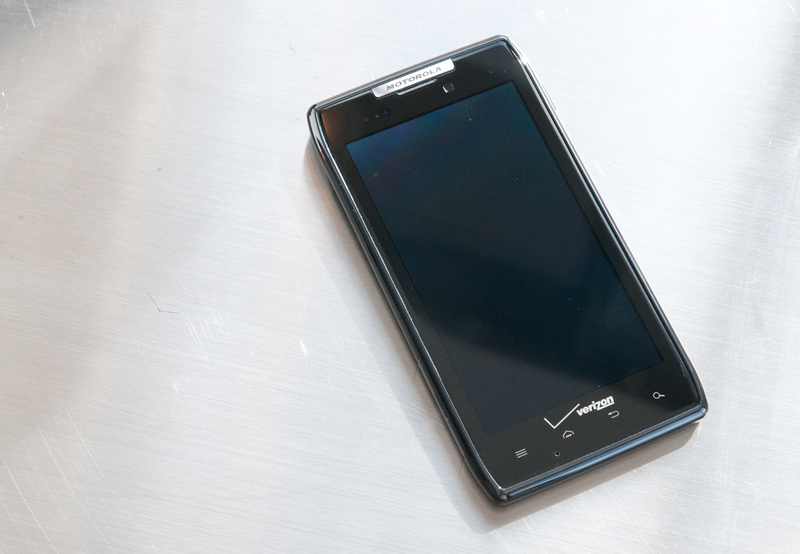 Recently Motorola unleashed a bunch of devices it was keeping up its sleeve, and the latest for Verizon is the Motorola Droid RAZR. A while ago we reviewed the Bionic, which was the first time we got to see 4G LTE connectivity (courtesy of a Motorola Wrigley LTE baseband) alongside a dual core OMAP4430 SoC. The RAZR continues with those two components and brings a new industrial design, a different display, and revival of the RAZR brand itself. It’s safe to say that both elements of the tech press and a large demographic of end users are starting to wake up to something we’ve known and been talking about for a while now: that unique combinations of SoC and cellular baseband (what I call a hardware platform) define devices, and that often new devices are just iterations of those existing hardware platforms with tweaks to accommodate individual carrier customers (different cellular frequency bands, different aesthetics, different software preloads, etc.). A shaky analogy is to compare it to putting a different case on the same computer or how PC ODMs shop around reference designs. The extra component in the smartphone world is of course carriers, (and the endless variants of hardware platforms that result as a consequence) but there are really only a few different unique hardware platforms that emerge each year. To that end, the RAZR is an obvious evolution of the Bionic purely because it has the same OMAP4430 SoC (albeit at 1.2 GHz as opposed to 1.0 GHz in the Bionic), the same 3G and 4G basebands (MDM6600 and Motorola Wrigley), and the other same big component choices. 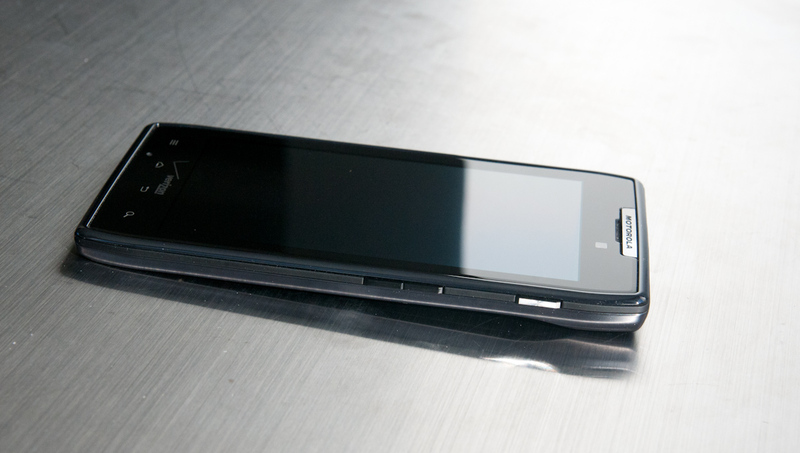 The real story of the RAZR is its incredibly thin profile and the new direction in Motorola’s industrial design that it embodies. I’ve outlined the specs in our usual comparison table for your perusal, and though we haven’t seen them quite yet, the two other devices that are noteworthy for Verizon shoppers right now are the HTC Rezound and the LTE-enabled Galaxy Nexus. Screen 4.3" 960 x 540 RGBW LCD 3.5" 640 x 960 LED backlit LCD 4.65" 1280x720 SAMOLED HD 4.3" 960 x 540 SAMOLED Adv. 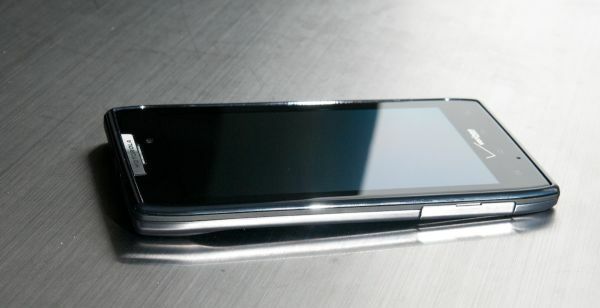 The RAZR is absurdly thin, and coming from the Bionic (which when it launched was itself absurdly thin for an LTE device) it’s almost shocking. With the two side by side, this difference is dramatic. 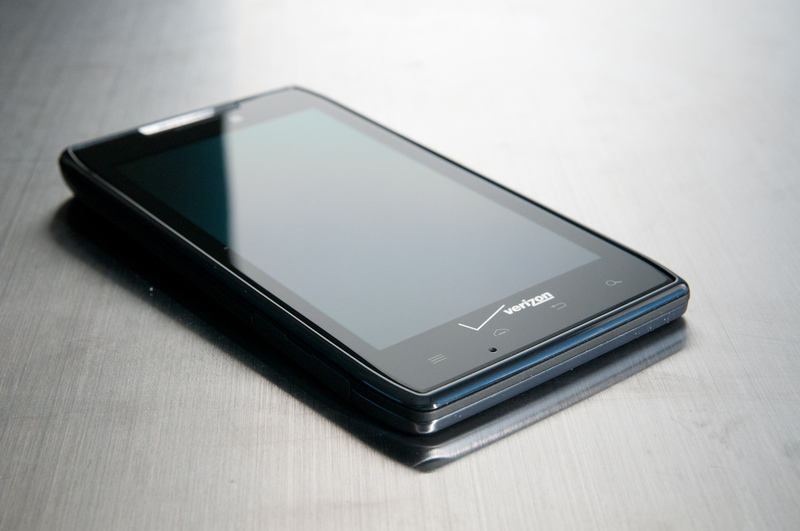 Lately there’s been something of a ‘who can make the thinnest smartphone’ war going on between manufacturers, and the RAZR even bests the SGS2 when it comes to its waistline. Of course, every design decision has a tradeoff, and what the RAZR had to do away with to get to this kind of design profile is the user-replacable battery. 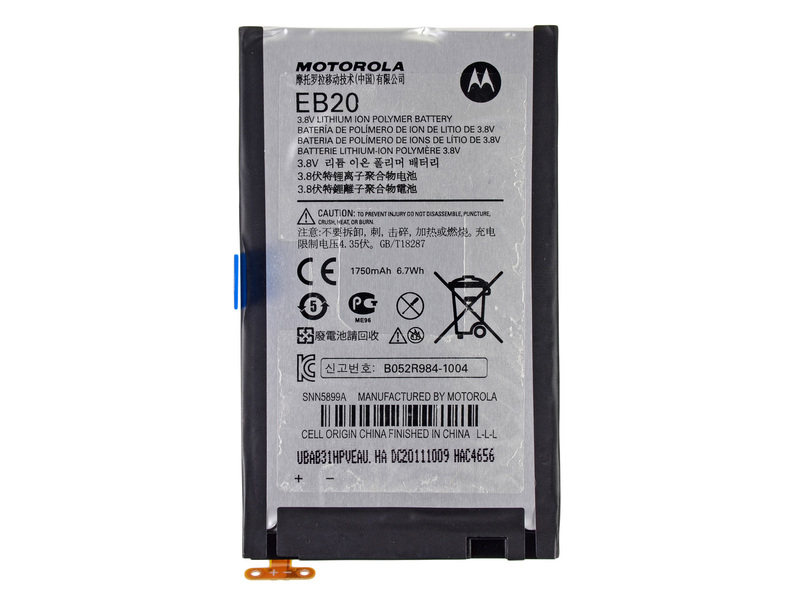 Instead, the RAZR’s battery is sealed inside the phone. When I reviewed the Bionic, I made note of the device’s higher than normal Li-Ion voltage battery (3.8 V nominal) and later received word that this is actually a new Li-Ion battery chemistry that Motorola is adopting across its device line. 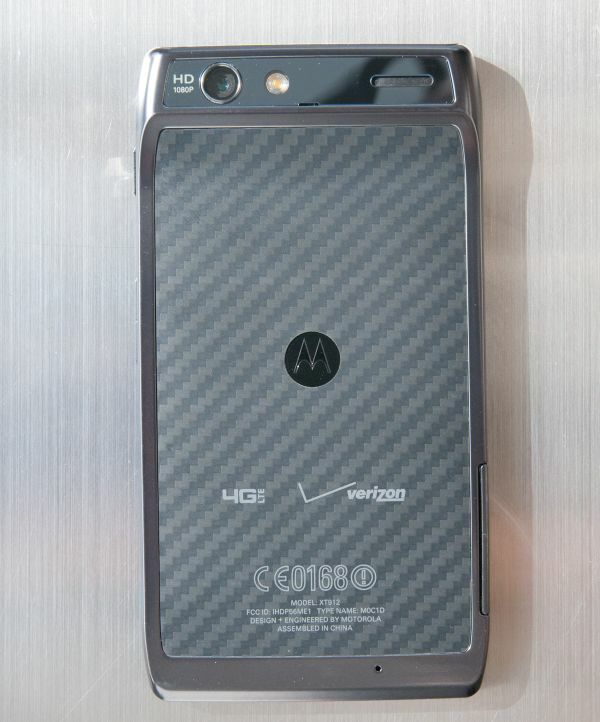 We’ve now seen it in the Bionic, the Atrix 2, and thanks to some teardowns know that it’s inside the RAZR as well. As an aside, people love to talk about how battery tech is going nowhere, but here we have a clear example of a few mass-market devices actually shipping with higher voltage batteries. Now that I know it exists, I want this in everything. Interestingly enough, the sealed internal battery on the RAZR is 1750 mAh at 3.8 V (6.7 Whr) which is ever so slightly larger than the Bionic’s stock 1735 mAh at 3.8 V (6.6 Whr) battery. Like the Bionic, the battery has a thin profile and extends across almost the entire area of the device. We’ve now seen two different approaches to getting devices ultra thin: dual-sided PCBs that take up about a third of the areal profile (which is what Samsung and Apple do), saving the rest for a thick battery, and the Motorola approach with a single-sided PCB and a thin battery that extends over the entire area. 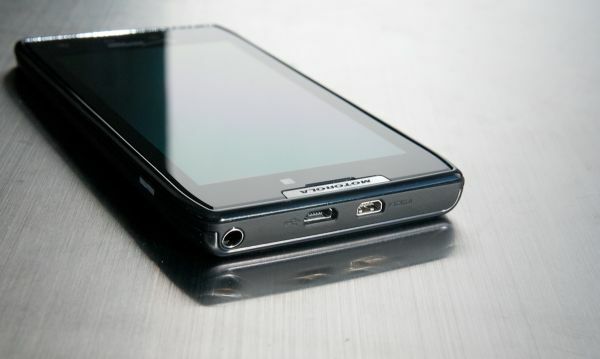 The result of this design methodology is that the RAZR has a huge areal profile with a lot of bezel at the top and bottom. It doesn’t look like much, but as a result the device feels large in the palm (which is primarily a function again of areal size), but small in the pocket (which is a function of thickness). These are the kinds of tradeoffs that we’re still seeing happen in this slate form factor, one which shows no signs of going out of style. One lingering question is what you’re supposed to do if the RAZR hard locks - obviously since the battery is sealed inside, a battery pull is out of the question. Thankfully holding volume down and power/lock for 10 seconds reboots the device even when the device is totally unresponsive (which I did in fact encounter once). Back to purely subjective aesthetics, the front of the RAZR is one continuous piece of aluminosilicate Gorilla glass just like the Bionic, complete with the interesting taper and gap at the edge where it meets the plastic case. I haven’t had much dust settle in here or get stuck, but just like the Bionic it does seem like it’ll happen eventually and warrant a blast with some compressed air. The profile of the RAZR isn’t a square, nor is it rounded at the edges, instead taking on something of Battlestar Galactica’s octagonal paper shape. 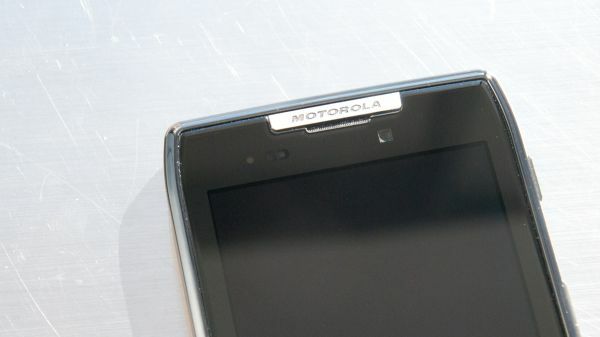 We’ve seen photos of other upcoming Motorola smartphones emerge with this shape, and it’s clear that their industrial design is going in this octagonal direction. Between the menu and home capacitive Android buttons is the primary microphone, and at the very top are proximity and ambient light sensors. At the right on top is the RAZR’s 1.3MP front facing camera. The right side of the RAZR is home to a chrome ringed power/lock button, and below it is a one-piece volume rocker. These buttons are all plastic, but feel pretty good in spite of being very thin. The chrome textured power/lock button helps make it easy to identify with the index finger and is a nice touch. Up top is the headphone jack, microHDMI and microUSB port. The bulge at the top echoes the earliest Droid X designs with this ever-present bulge which traditionally was to accommodate the camera module. In this case you could make the argument that the bulge now accommodates the camera module and headphone jack, considering its size. 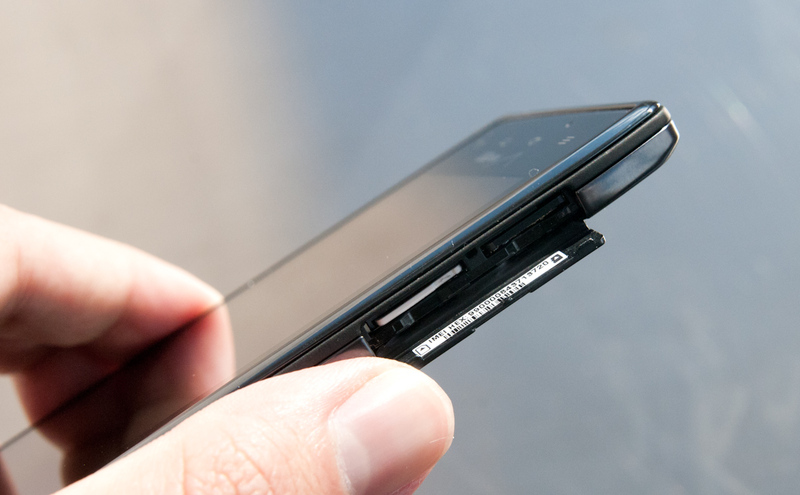 Since the RAZR is essentially sealed, you might be wondering where the microSD and SIM cards go. The answer presents itself underneath a small door on the left side. There’s a thumb gap which opens to reveal that the microSD and microSIM card slot. This isn’t the first time we’ve seen Verizon using a microSIM, if you recall back to the Galaxy Tab 10.1 LTE which also used a microSIM, and consider the LTE enabled Galaxy Nexus which will use a microSIM. Thankfully using a microSIM isn’t that big of a deal anymore given how relatively common and cheap SIM cutters and microSIM adapters are now. The RAZR backside is a bit more complicated. Like most new phones, there are two microphones here for noise cancelation and to support stereo audio recording for video. One is just off-center at the very bottom on a chrome lip, the other is center at the top just to the right of flash. 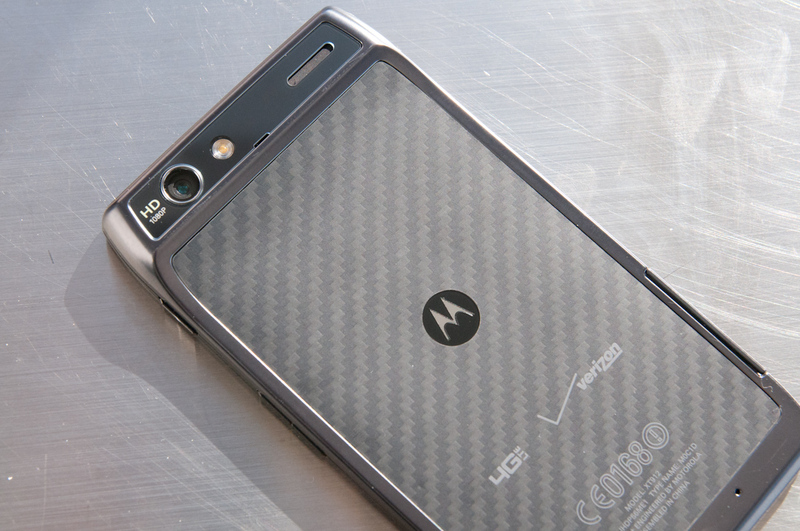 Of course the most prominent and noteworthy feature here is the kevlar backplate, which gives the RAZR a distinctive in-hand feel and style. The kevlar area is definitely flexible - you can press and poke it with your fingernail - and has a rubberized feeling. The result is better than expected in-hand feel, and not the typical homogenous plastic texture I’ve grown accustomed to after handling lots of Samsung devices. This kevlar region looks nice, feels good, and sounds pretty serious, but don’t be fooled - the RAZR isn’t going to stop any bullets, and its real purpose here is to keep thickness to a minimum. Further, kevlar’s actual valuable material property is in tensile strength, whereas for a back plate I’d wager the more important metric is compressive strength. The RAZR’s plastic frame offers plenty of rigidity and doesn’t yield or flex at all in normal use. 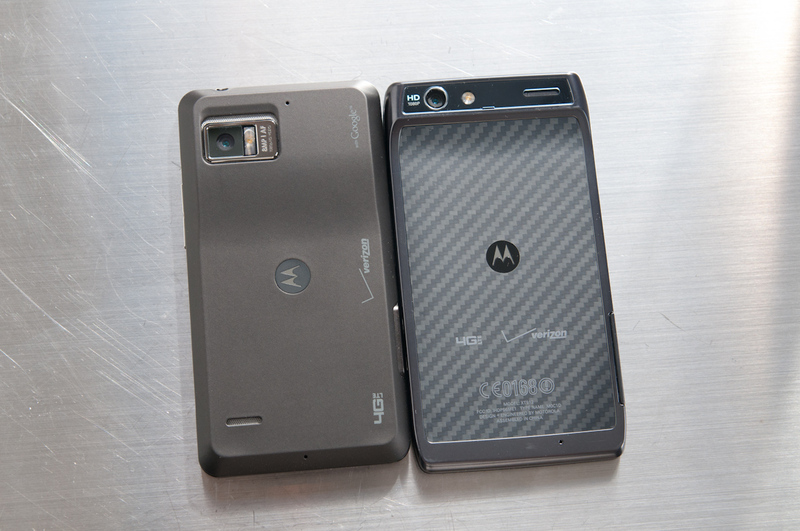 The kevlar backing continues up to the RAZR’s top bulge which houses the phone’s 8 MP camera module, flash, microphone (as we’ve mentioned already), and speakerphone grille. This little area has a reflective chrome region that definitely collects grime but comes clean pretty easily. 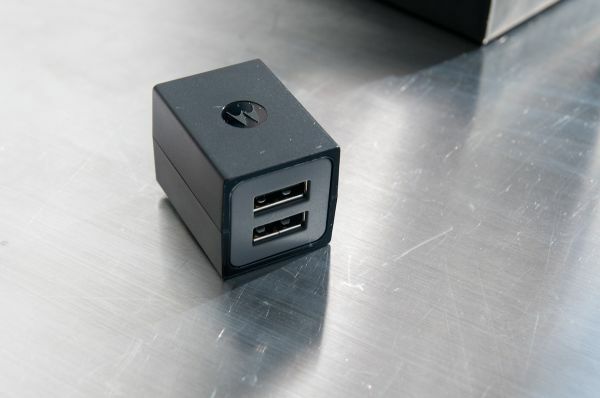 I have to admit that I like the direction that Motorola is taking with its industrial design. After seeing a lot of the same from everyone in 2011, this feels like a big departure from previous devices in a good way - the RAZR is freakishly thin (and relatively light) but still has the build quality that makes it feel like it’s worth the high-end price tag and reviving a brand that’s 6 years old. It’s also safe to say that we’re going to see this style and design replicated in Motorola devices coming out in the immediate future, including the Droid 4. 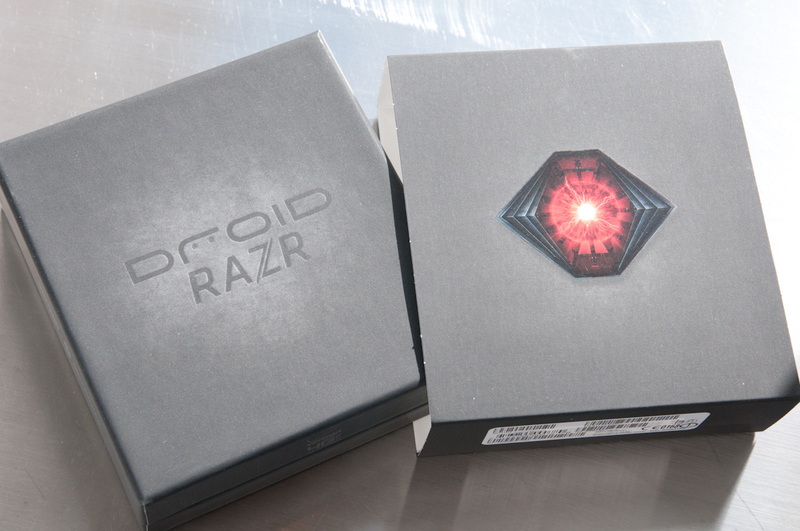 I usually don't give unboxings or packaging much attention, but in this case the RAZR deviates from the standard Verizon 4G LTE box shape and instead is thin and squareish. In addition Motorola is shipping a different USB power adapter now that's much smaller, square in shape, and has two USB ports, though output per port is at 750 mA as opposed to 850 mA on the previous chargers. I think the phone would be way nicer without an edge that sticks out. It makes it look dated already, but there's probably a structural reason to have it there (or something). IanCutress: @ghost_motley @witeken If it ends up on a reputable news outlet, you know it's confirmed and double sourced, right? ganeshts: @IanCutress @BrettHowse You can do that :) I do it in my YouTube test automation. IanCutress: @BrettHowse Simulate mouse movement? andreif7: @mikusr You avoid the stupidity of ACPC's need for a second data plan. andreif7: I'd like to try to the HP Elite X3 but the AZERTY version is like 700€ - haha. RyanSmithAT: @Tarocknet @IanCutress It's not a federal holiday, and most states don't give it either. So a lot of people are working.